The practices have all been run, qualifying runs have taken place, drivers have been bumped and the field has been set. Now all that’s left to do is run the race. Ok…there is Carb Day today, but it’s been a while since anything significant came out of Carb Day – other than more than a few unclean and unsightly people. I’m all about tradition, but one thing that bucked tradition that just made sense was moving Carb Day from its traditional Thursday date to Friday. I’m not exactly sure when they did this, but it was probably over a decade ago. Moving it to Friday made sense for a lot of reasons, especially for those coming in from out of town. Carb Day is really not my thing, and that’s not just age-related. When I was in my early twenties, it still would not have been my thing. I’m old enough to remember the original Snake Pit up in Turn One. When the 1967 race was halted for weather, we made our way back to our car that was parked in the infield. Our route took us through the Snake Pit. I was eight years old at the time and I saw things that an eight year-old should not see. It’s a wonder I was not scarred for life. Some think perhaps I was. But I realize that Carb Day is a big deal to a lot of people, and it is probably a big money-maker for IMS – therefore I’m all for it. The one thing I do like about Carb Day is the practice, which serves as the dress rehearsal for the “500”. Unfortunately, the practice starts at 11:00 and lasts for only one hour, which makes it tough to make if you’re leaving Nashville that morning (losing an hour with the time change). Last year, we decided to drive up to Seymour, Indiana on Thursday night and stay in a very cheap hotel that my first wife would have turned up her nose at. Fortunately, Susan rolls with the punches and is not above staying at a place that was less than desirable. But with what we have to pay for our room each year on race weekend, I was not anxious to shell out much more. Fleabag hotel aside, it worked out well. After a good night’s sleep, we got up and showered and made our way to IMS and were there by about 9:30 am, when most of the crowd was still somewhat sober – although it was already apparent that by showering that morning, we were in the vast minority. We took in the entire practice and were able to enjoy the morning and early afternoon before things got too rowdy. It worked out so well that we are following a similar plan for this year. We left shortly after work yesterday and drove all the way to Edinburgh, Indiana last night and stayed in a much nicer place using Susan’s points from work. We only have thirty miles to drive on I-65 to reach I-465. Once we get there, it’s not far at all to IMS. Who knows? We might get there early enough to go to Charlie Brown’s before hitting the track. The Month of May flies by for me. It seems like it was just last week when I was attending the Open Test on April 30. Suddenly, we are already in our last weekend at IMS for the month. The clock seems to speed up whenever I step foot on IMS property. Monday will start the annual funk when it dawns on me that it’s all over. But that’s Monday and this is Friday morning. There’s a lot to see and do between now and then. There is no Burger Bash this year, so we’re discussing going out to Lucas Oil Raceway (the old IRP) for the USAC Silver Crown race tonight, but nothing has been decided. My oldest brother and his gang are getting in late tonight, but not until after 10:00. Tomorrow we will go to the track for Legends Day. That is not a day for the party crowd. It’s a day for hard-core race fans and those that care about the history of the Indianapolis 500. In the past, they have celebrated drivers like AJ Foyt, Parnelli Jones and Mario Andretti. This year, they are not celebrating a driver. Instead they are honoring a car – the roadster. There will be a large static display of roadsters and other vintage cars on display in the East Museum parking lot from 8:00 until 3:00 on Saturday. At 11:15, the historic cars will be turning laps on the track until 12:20. This is one of my favorite events of the month. Normally Donald Davidson is on the PA telling the history of each of the cars. You get to hear what those old Offenhauser engines sounded like and how big those wonderful old cars were. In the afternoon, I’ll go to the museum with my brother and his bunch, even though I went last weekend too. It’s a family tradition. But lately, Susan has ducked out of that tradition. I think if she never sets foot in there again it would suit her just fine. That works for me because it saves me ten bucks. Some people just don’t appreciate history. We are foregoing the Legends Day concert on Saturday night. Susan and her son went to Jason Aldean a few years ago, and we both went to it when Blake Shelton played. Being from Nashville, we both like country music but neither of us are big Sam Hunt fans so we will pass this year. That’s fine because we like to eat an early dinner at Dawson’s and get to bed early the night before the race, since we get up at 4:00 am to be inside the track before 6:00. Not only is that a necessity to avoid traffic, there is something surreal about being inside the track before the sun comes up. Although the track itself seems calm and peaceful, the amount of activity in the Pagoda Plaza and especially the garage area is staggering for that time of day. 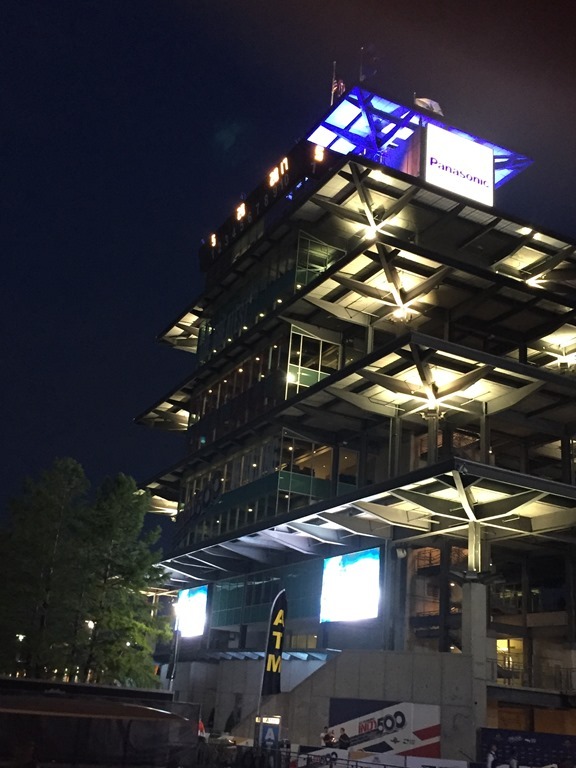 Here is a picture of The Pagoda I took last year on Race Morning as soon as we got inside the grounds, and then a picture of the track from the IMS Media Center. The light you see is coming off of the video boards, which were solid white screens just to light up the place. It worked. I always like being at the track that early just to experience the calmness just before things get really crazy. It just seems to start the day off right. So now it’s come down to who will win the 102nd Running of the Indianapolis 500. For the past two years, we have had some rather unlikely candidates emerge as winners of this event; with rookie Alexander Rossi in 2016, and Takuma Sato last year. The same thing might happen this year. I cannot remember a year when practice and even qualifying really didn’t give us a good idea on who was fast and who wasn’t, like this year. Throughout practice, the only drivers who were consistently fast on a daily basis were Ed Carpenter and Marco Andretti. Carpenter ended up on the pole, while Marco will start twelfth. Rossi was the tenth quickest on Saturday and the first driver out of the Fast Nine, after his run on Sunday he will start from the middle of the last row. Go figure. For the first time in years, AJ Foyt’s team is relevant going into Sunday’s race. In fact, they are very relevant. They suffered through never quite sorting out the Chevy aero kit last season to being on par with everyone else in the common aero kit age. They now have the same Chevy engine that made up seven of the Fast Nine cars last weekend and also sits on the pole. Tony Kanaan is now in the famous No.14 and seems to be having fun again. He was the fastest of the non-Fast Nine cars and is actually faster than Scott Dixon, who was the slowest of the Fast Nine. Kanaan has a fast nineteen year-old rookie as a teammate that will start alongside of him on Sunday. Tony Kanaan can win this race, and it would not be a fluke to see “14” at the top of the scoring pylon when Lap 200 is complete. For the first time in several years, the Andretti Autosport cars are not fast. Of the six Andretti cars, Marco Andretti has the highest starting spot, starting twelfth. Ryan Hunter-Reay, the 2014 winner, will start fourteenth. Carlos Muñoz will start twenty-first in a one-off effort with his old team, Stefan Wilson will be in the middle of the eighth row, Zach Veach will roll off twenty-sixth and Alexander Rossi, the 2016 winner, will start from the middle of the last row. Chip Ganassi Racing had lots of success starting about ten years ago. His team won the race in 2008 when Scott Dixon won his only “500”. They won it again with Dario Franchitti in 2010 and 2012. But since then, Ganassi’s team has struggled in the Indianapolis 500. Scott Dixon started on the pole last year, but his day ended in a frightening crash on Lap 52 when Jay Howard lost control of his car in Turn One, drifted across the track after hitting the wall and served as a launching ramp to a helpless Scott Dixon who just happened to show up at the wrong time. The result was probably the most frightening crash I have ever seen, when the driver walked away relatively unhurt. With the slight disadvantage of the Honda engine and being with a scaled down Ganassi team, Dixon has been way off of the radar this month – just where he likes being. Anyone discounting Dixon on Race Day is foolish. Then there are the four Penske cars. Three of them will start second, third and fourth; while Helio Castroneves will start eighth. Any of these four cars could bring Roger Penske his seventeenth Indianapolis 500 victory. Can Dale Coyne end up in Victory Lane at the Indianapolis 500? As strange as it seems to anyone that has followed this sport for a while, the answer is – absolutely! As long as Sébastien Bourdais is in the cockpit and Craig Hampson is the engineer of the No.18 car. It would be a sweet comeback for Bourdais after his horrifying crash in Indianapolis 500 qualifying one year ago. It’s impressive that Ed Carpenter is on the pole, even though he’s been there twice before. What’s even more impressive is that his smaller team placed all three of their cars in the Fast Nine last weekend. Not only will Carpenter start from the pole, Spencer Pigot is almost unnoticed in his sixth starting spot with Danica Patrick starting seventh. You may not care for Danica off of the track, but there is no denying that she is strong at this track in an Indy car. She could make history this weekend as all three of the ECR cars are capable of winning Sunday. Confused? I am. But I always predict a winner before every race and this year will be no exception. I’ve only picked one winner who actually won, Tony Kanaan in 2013. Some people only pick with their heart and some pick with their head. I tend to do both. I’ve narrowed it down to three – Josef Newgarden, Tony Kanaan and Helio Castroneves. All three of my candidates are from my heart, but I can only pick one. I’m afraid Tony Kanaan’s crew will do him in when it’s time for a critical pit stop. That’s been the Achilles heel of this team for years and I’m afraid a bad pit stop will rear its ugly head for Kanaan after driving a great race. That’s why I think a Penske car will win this race. When you have a lot of drivers that are as even as they are going into this year’s race, I think the difference will be made in the pits. Few do pit stops like Team Penske. I really like Josef Newgarden and not just because he is from Nashville. I like the way he carries himself out of the car, but I am also very impressed with his driving ability inside the car. I think he has a great future ahead of him and will probably end up with more than one Indianapolis 500 win before his career winds down. But from the time I saw him at the test on April 30, I’ve witnessed a more determined Helio Castroneves than I’ve ever seen. He wants that fourth win and he also still wants to be driving in IndyCar. His pride was ruffled with that offseason switch and that’s not a god thing – for the other drivers. He has been as fast as ever this month, his Sunday qualifying run notwithstanding. That’s why I predict that Helio Castroneves will win the 2018 Indianapolis 500. As always, please follow along here all weekend. I will have another Carb Day post after the final practice later today. I’ll also post at least once from tomorrow’s Legend’s Day, with (possibly) another post from Susan tomorrow. Then Sunday, I’ll post at least once before the race (maybe twice) and then again after the race with a post-race wrap-up. My “Random Thoughts” will probably be Tuesday, but possibly Monday – it depends on how tired I am after the race. After that, I plan to take off the entire next week until the Monday after the double-header at Belle Isle. I’ll be ready for a break by then. Also, please don’t forget you can follow along on Twitter for more photos, videos and comments throughout the weekend. But don’t be expecting Tweets during the race. I’ll be too busy watching. You can follow me on Twitter at @Oilpressureblog or Susan at @MrsOilpressure. Race Weekend is finally here! This entry was posted on May 25, 2018 at 4:03 am and is filed under Indianapolis 500. You can follow any responses to this entry through the RSS 2.0 feed. You can leave a response, or trackback from your own site. Always rooting for the underdog and playing with my heart instead of my head …… I’m going for Munoz! The best weekend of the year is here!!!!!!!!!!!!! Your comment on being inside the track before the sun comes up, reminded me of 1984 when I crewed Dennis Firestone at Indy and also John Andretti. John raced Rolie Helming’s midget at IRP the might before the 500 and after that race we towed it to Aldo Andreitti’s tire shop and left it there, We then proceeded to the track in the tow van and slept in the it in the infield team parking lot and were woken up by the state Police helicopters landing behind the museum. 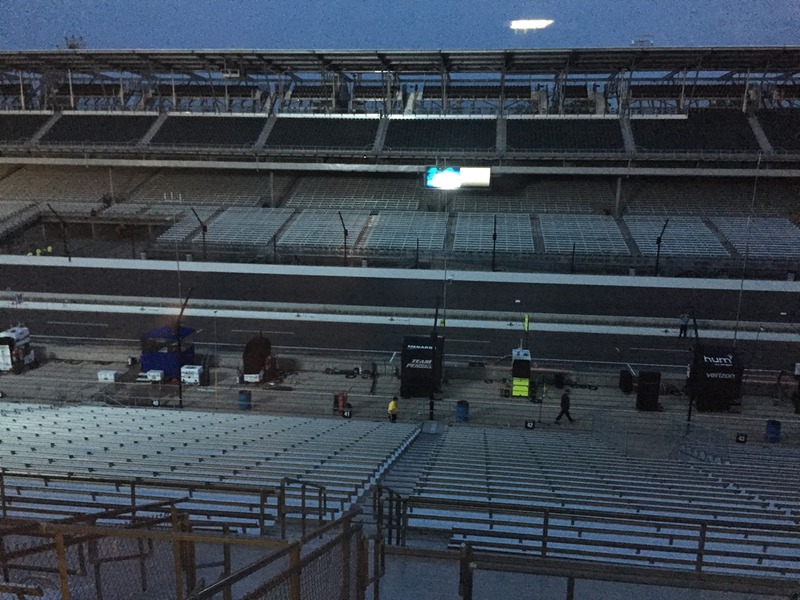 Walking from the van to the garages in the pre-dawn with the track waking up for its big day was one of the highlights of that best Indy year for me. It’s like racing Christmas eve! If he can finally stay out of trouble, I think Ed Carpenter is going to win this one. If he can’t, Will Power is my second choice. As long as there is not a major issue on the track taking out the leaders, I think one of these two veterans is going to do it. I am not sure who to pick so I will list a few. Newgarden is the ultimate favorite. Wickens would be a cool rookie surprise and Bourdais is the underdog story. My wife is rooting for Veach because he has an awesome scheme so I guess I can get behind that also. There is no experience on Earth like being in IMS over night ahead of the 500, hearing the commotion all night on 16th Street, then witnessing the change as the cannons announce the opening of the gates and watching the place fill with all the people. It is also interesting to see the track empty and become quiet as the sun sets on another race day. Enjoy it all George and Susan. For the first time ever, I will be watching it live on TV. I am hoping every driver will be healthy to attend the Victory Celebration Monday evening as well as all crew members. Who will win? I predict with absolute certainly that it will be the driver in the first car to cross the finish line after 200 laps (weather permitting).